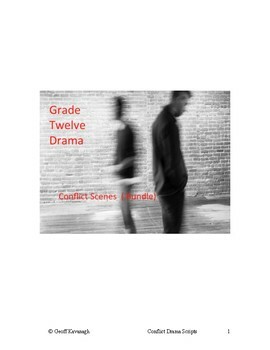 This product contains all 30 Long Form Drama Scenes from the Conflict Drama Series - Grade 12. There are 12 scenes based in 'Friendship' conflicts and 18 based in 'Relationships'. The scenes are also designated as Comedic or Dramatic. The Long Form Drama scenes are the final units I teach in both Grade 11 and 12 and they are intended to advance the students' knowledge and skill in playing different dramatic and comedic characters as well as continue the processes of script and role preparation. All the scripts for these units are original, and have been written for the age and grade level of the students. They range in difficulty but they challenge the students to perform a number of different characters and conflicts, which keeps them at an active/exploratory level. Taken together, these scenes will comprise a roughly 40 class unit, depending on the number of scenes you expect students to perform. Teachers should note that this unit part of the script based approach to teaching drama (Conflict Drama Scenes) that begins with Neutral Scenes and culminates with the Long Form Drama Scenes. All scenes are written within a partnership framework (A/B characters) and all roles are more or less equal in these scenes. In the use of these scenes in class then, all students would be expected to be working equally on character and role creation in the class. This product is not only intended for experienced teachers looking for materials and specific scene types. 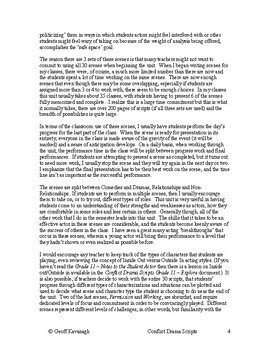 As this unit is extensively explained (Notes to the Student Actor), it would also be of use to beginning teachers. Teachers should note, however, that this unit will require some teacher participation in terms of deciding how to mark, present and rehearse these materials within their classrooms. These is not a 'classroom kit' with tests and answer keys - these are more the 'materials' that are to be put into students' hands each day. 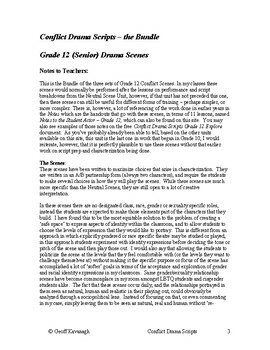 For an explanation of the whole approach (Conflict Drama Scripts) for this Grade 12 level, please see the "Grade 12 Exploration" Document available on this site.